Follow the manufacturer's safety recommendations when operating your RV stove. One of the essential items in your motor home is the propane gas stove. Propane offers an efficient fuel for cooking, but you must take precautions when using the stove. Be conscious of the possibility of propane leaks, and have everyone evacuate the recreational vehicle if someone shows symptoms of carbon monoxide poisoning, such as dizziness, sleepiness or headaches. And never use the stove or oven to heat your RV. Understand that the main difference between an RV stove and your home's natural gas stove is in scale; the RV stove will be a bit smaller. The burners look the same and work the same. You keep them clean in the same way, too. You may need to light a pilot to begin operating the stove and oven. Realize that you have to monitor the level of propane in your tank, as opposed to always having the gas "available" at home. Get used to how much propane you use in a day in the RV so you'll know how often you'll need to refill the propane tank. Take steps to avoid rattling noises on a trip. When driving, you'll notice that the stove in a motor home can make a lot of rattling noise. Make sure you remove the metal grille on top of the stove, placing it in a drawer surrounded by towels or other soft objects. Also, put a few kitchen towels in between the door of the oven and the stove body itself. That will prevent any banging of the stove door. Of course, make sure you shut down the gas and the stove before preparing to drive off. Know the location of propane shut-off valves. Store only soft items in the stove while driving to minimize noise. Use mild soap and water to clean up. Consider your RV stove to be a lot like your home stove. Clean and maintain it in much the same way. Open a window and turn on the range hood fan before cooking. This will remove moisture and any lingering carbon dioxide from the system. 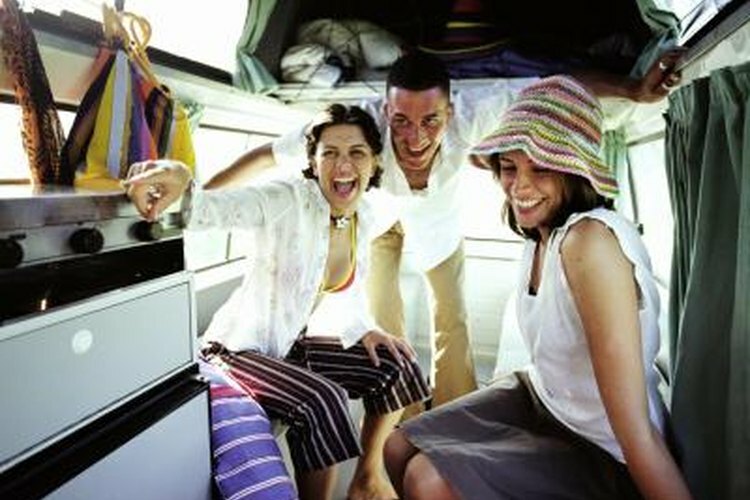 Get to know your RV before your first camping trip. Carefully follow your manufacturer's instructions. It's best to discover problems or capacity issues at home or in a powered and supplied RV park first.